"George W. Eaton, a lifelong resident of Wakefield and one of its best-known citizens at the time, was the proprietor of G.W. Eaton, Grocers. The store was located at 394 Main Street from 1889 to 1917. Born in Greenwood, George Eaton was a valued member of the local Grand Army Associate Members Association. He was an active member of the Baptist Church, at one time serving as the superintendent of its Sunday School. When Eaton retired in 1917 after 28 years in the grocery business, he disposed of his goods and closed the store, not selling the business to another individual. At the time of Eaton's death in 1925, the storefront on Main Street was home to Walton's Undertaking Rooms." -- Text from calendar by Jayne M. D'Onofrio. “G.W. 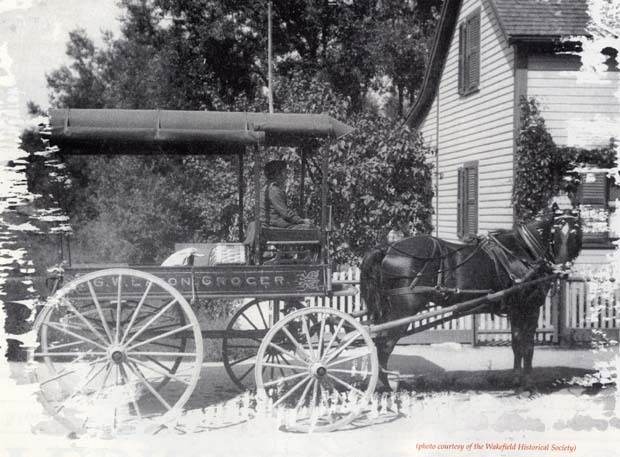 Eaton, grocer delivery wagon, circa 1900,” NOBLE Digital Heritage, accessed April 22, 2019, https://digitalheritage.noblenet.org/noble/items/show/6950.